Smart is the New Rich: Money Guide for Millennials is an interactive, step-by-step guide to all things money. From credit, student debt, savings, investing, taxes, and mortgages, CNN's chief business correspondent Christine Romans shows this newest generation of earners how to build wealth. You'll learn the old-fashioned approach that leads to a healthier financial lifestyle, and open the door on a straightforward conversation about earning, saving, spending, growing, and protecting your money. You'll learn how to invest in the stock market or buy a home, even if you are still paying off student loan debt. Romans offers expert insight on the "New Normal," and why the rules of the credit bubble—the one you were raised in—no longer apply. Checklists and quizzes help solidify your understanding, and pave the way for you to start putting these new skills into action. For thirty years, the financial rules for life revolved around abundant credit at the ready. A quick look around makes it obvious that those rules no longer work, and Millennials just now coming of age and entering the workforce need a new plan to build a solid financial foundation and healthy money habits. This book puts you on the right track, with step-by-step help and expert guidance. The economy is out of recession and growing, but many young people feel left out of the recovery. It's why smart spending, saving, and debt management is so critical right now for them. A smart money plan is no longer a "nice to have" extra, it's mandatory. Smart is the New Rich: Money Guide for Millennials is your guide on how to use time and some good money manners to build wealth. CHRISTINE ROMANS is CNN'S Chief Business Correspondent and anchor of Early Start with John Berman and Christine Romans weekdays 4 a.m. to 6 a.m. ET. She won an Emmy award for her work on the series "Exporting America" about globalization and outsourcing American jobs overseas. 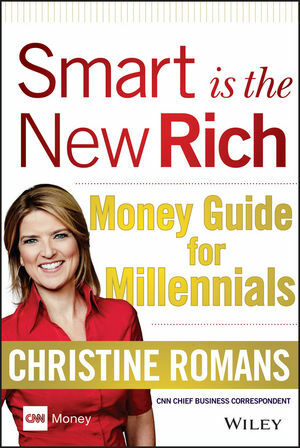 She is the author of Smart is the New Rich: If You Can't Afford It Put It Down and How to Speak Money.